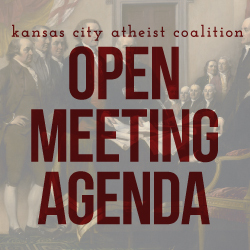 Long ago, in response to feedback asking for greater access to the goings-ons within the Kansas City Atheist Coalition, we opted for a model of every other board meeting being closed and every other board meeting being open to dues-paying members. In a move to increase transparency and accessibility to the board by our members, we are going to start having all of our monthly board meetings open and available to any who is an active dues-paying member. No Comments to "All Board Meetings Are Now Open to Members"